New world flavors meet the old South dining scene as Latitude opens in the heart of Atlanta. Micah Willix has navigated his way as the former captain of the helm at Ecco to launch this endeavor in the former location of the Grape at Phipps Plaza reclaiming the space as Latitude. His new restaurant promises to be a brave adventure in the world of fine-dining at the mall. Latitude has a worthy crew of Kenny Perlman (formerly of Seasons 52 and Houston’s) and Emily Streib Marcil, (of The Capital Grille and currently of Second Growth LLC). Together with Willix, they bring a world-cuisine that focuses on creative, globally inspired and flavorful food. Always tough to do, but they chose the right time to open during the hustle-and-bustle of the holiday season at this Atlanta shopping mecca. 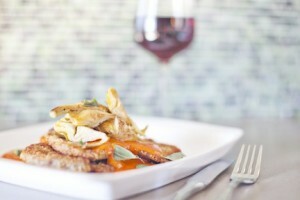 Educated foodies and starving shoppers alike can enjoy Willix’s fine dining. Think tuna ceviche with charred avocado, lime juice and extra virgin olive oil, scallop crudo with saffron, fennel and champagne vinegar, plus golden tile fish with quinoa; or for the land lovers it’s beef tartare with roasted garlic, fried capers and fresh aioli. Sounds like all the right ingredients for an eclectic and tasty menu. Pan-fried pork chop with artichoke confit, tomato and oregano paired with a tall glass of fine wine. Latitude’s main dining room and bar, the wine room offers the ideal option for intimate dinners and showcases the impressive wine selection in hardwood, floor-to-ceiling racks. Guests can also retreat to the oversized patio which creates an urban oasis offering comfortable rattan lounge seating, as well as a 14-foot high-top, concrete communal table perfect for sharing an al fresco evening with friends. Oversized planters and garden designs will flank the exterior of the patio while a tile encompassed water feature allows guests the opportunity to nestle in for a cozy evening. Located at Phipps Plaza, Latitude serves lunch Monday through Friday from 11 a.m. to 4 p.m. and Saturday and Sunday from 11:30 a.m. to 4 p.m. Dinner is served Monday through Thursday 4 p.m. to 10 p.m., Friday and Saturday from 4 p.m. to 11 p.m. and Sunday from 4 p.m. to 9 p.m. Additional information can be found on Latitude’s website and to make a reservation please visit the website or call 678.990.9463. Pretty Southern is excited to check out Latitude this coming Thursday. Check back later this week for our interview with Chef Micah Willix. Have you been to Latitude? If so, what did you like about the place (or do you have suggestions for the new concept?) Please comment below!